Lanzarote is situated just 70 miles off the coast of Africa and is the most easterly of the Canary Islands. The island is 37 miles (60km) long and 12 miles (20 km) wide, making it the fourth largest island in the Canaries. Lanzarote enjoys a mild dry climate with average daytime temperatures ranging from about 21�C in January to 29�C in August. Annual rainfall is just 140mm (5.5 inches). This makes Lanzarote the perfect year-round destination. As with the other Canary Islands, Lanzarote is Volcanic in origin. Due to the recent eruptions during the 18th and 19th Centuries, many parts of Lanzarote appear to be from another world, often described as 'lunar' or 'Martian', so much so that parts of 'Planet of the Apes' were shot here. The dry climate (and lack of erosion) means that the Volcanic Landscape appears much as it did just after the eruptions. Amongst the many stunning Volcanic features of Lanzarote is the longest Volcanic Tunnel in the world, the Atlantida Tunnel, which is over 7 km long and includes the La Cueva de los Verdes and Jameos del Agua. Despite the Volcanic nature of the island,Lanzarote has several beautiful white beaches such as at Playa Blanca and Papagayo. There�s not much argument about the most beautiful beach on Lanzarote, and the good news is that because it�s at the southern tip of the island and a bit remote, the white sands of Papagayo are not always packed beach towel-to-beach towel like some in the Canary Islands. Actually, there are several beaches in a series of coves in the Papagayo area, several of them favored by nudists. The water is clear, and the view across the water to neighboring Fuerteventura island is a classic. 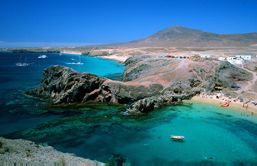 From Playa Blanca, on the southern end of the island (and the closest accommodations to Papagayo), head north to the volcanic lunar-like landscapes of Timanfaya National Park and Monta�as del Fuego (Mountains of Fire). Have lunch in the park restaurant where traditional Canarian cuisine is cooked geothermally in a volcanic oven. Then swing down to the beautiful-but-busy Puerto del Carmen, the most popular of the island�s three resort areas, where just a short walk away from the holiday scene you can stroll through the quaint Old Town, lined with waterfront restaurants. C�sar Manrique Cabrera was born on April 24, 1919 in Puerto Naos, Arrecife (Lanzarote), the son of Francisca and Gumersindo. His father was a food merchant and his grandfather a notary public. C�sar preceded his twin sister Amparo by just a few minutes. He had another brother, all of whom are alive today. Don Gumersindo came from Fuerteventura of good family background and emigrated to Lanzarote. 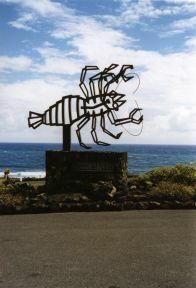 It is impossible to imagine Lanzarote as it stands today without C�sar Manrique. He was a painter, sculptor, architect, ecologist, monument preserver, construction advisor, planner of urban developments, outliner of landscapes and gardens. Manrique felt that he had to transform the island before the increasing amount of tourists overwhelmed and disfigured it irreversibly. With his great intuition combined with his incredible artistic ability he identified various areas on Lanzarote and improved their intrinsic beauty. Such works have become famous landmarks to be enjoyed by both tourists and locals alike. He died at the age of 73 in a tragic car accident, on the 25 of September 1992, next to the Fundacion. His legacy lives on thanks to his ingenious work and that of the foundation that honours him.